Italian Helichrysum or Everlasting is a perrenial plant. 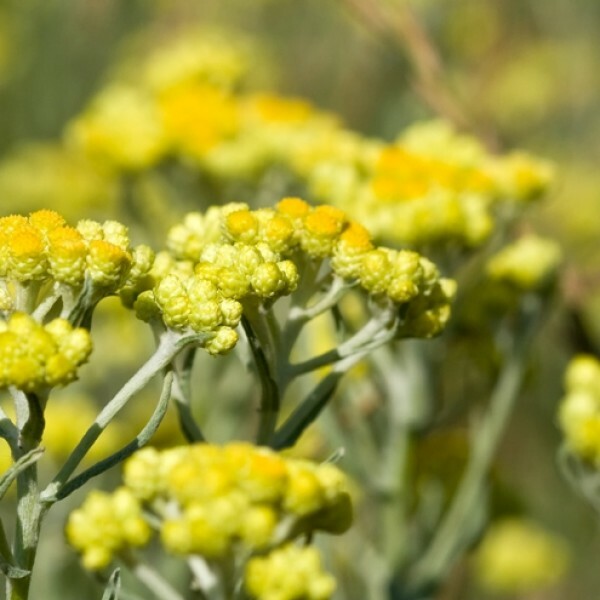 Helichrysum comes from the greek words "helios", sun, and "chrysos", gold, because its flowers look like little gold suns. It is found almost everywhere around the Mediterranean area and in Corsica, by the sea and inland. It is used for its particular biochemical compounds. Aroma and taste : Unusual. For some it is like honey on a warm toast, for others, dusty old clothes! Objectively, dry, warm, herbaceous, and hay like, with an edge of hot summer and dusty hilltops, and decidedly Mediterranean. The flavor is strongly bitter, almost soapy, with no hint of the sweetness evident in the scent. Stability and Shelf Life : Stable. Usually lasts for two years, although it is so effective for so many things it gets used before it fades. A strong anti-hematoma, although less dramatically analgesic than the oil. Applied in a compress to bangs and bumps or old aches, it can even bring subcutaneous bruises to the surface, exposing hidden damage. Wonderful as a sports rub after a workout or physical labor because of its powerful anti-inflammatory and mild analgesic properties. 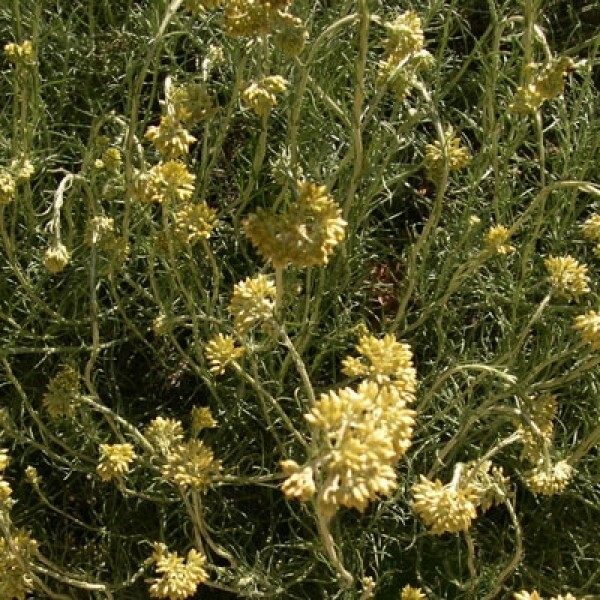 Used in synergy with the rather expensive immortelle essential oil, it can reduce the amount of essential oil needed during a long-term healing, such as for broken bones, where there is a lot of bruising and swelling. Significantly anti-inflammatory and cicatrisant for all wound and tissue damage. Combine immortelle with rock rose in a douche for endometriosis, fibroids, and painful periods. 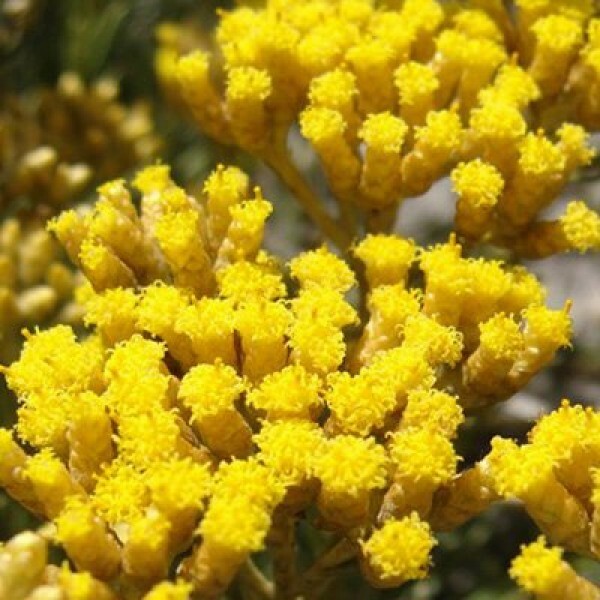 Immortelle is a must for aftercare in any surgery, speeding the healing of incisions and needle wounds, reducing swelling and bruising, and also detoxifying the liver of anesthetic. Use as a mouthwash after dental work. For gingivitis or receding gums, use one tablespoon neat or mixed 50:50 with water as a mouthwash two times daily every day for six months and watch your dentist be amazed.